The media company relies on Dropbox to collaborate more easily on comics design with its network of freelance writers and illustrators, enabling the company to always meet its punishing weekly deadlines. Comic book creation can be a rather herculean task. With content coming from an assortment of writers, pencillers, inkers, colourists and editors, it takes a lot of review and revisions to get stories right. For decades, many comic book publishers relied on paper methods during the creative process, shipping physical pages back and forth for approval. And even today it's not uncommon for publishers to have to push back releases by weeks or sometimes even months, which isn't ideal when hungry fans are waiting. Valiant Entertainment wanted to find a better way. After undergoing a significant growth investment in 2011, the company made it a mission to work smarter than its competitors, producing stellar work faster. Because Valiant work with anywhere from 40 to 100+ freelance writers and artists at any one time, they needed a simple way to support collaboration between external parties and internal staff members. The company explored different technology options, including an FTP server, online file-sending services and Dropbox Business. But Operations Manager Peter Stern explains "Only one of those options offered usability that matched our increasing demands without forcing people to learn a new skill set. Dropbox Business allows our full-time staff to work and collaborate seamlessly with upwards of a hundred outside contributors." "Dropbox Business allows our full-time staff to work and collaborate seamlessly with upwards of a hundred outside contributors"
Getting employees set up with Dropbox was easy – and also reassuring to Valiant, as they knew the solution could scale as the company grew. "We were able to implement Dropbox Business without any difficulties, using just our in-house knowledge" says Stern. "We didn't have to hire someone to set up a server; we didn't have to source anything offsite; we didn't have to predict how much space we would need down the line. We just set it up and used it." Now Valiant use Dropbox Business through every step of the creative process. As soon as writers and artists begin fleshing out storylines and characters, Valiant editors archive everything in Dropbox. This enables them to keep files readily accessible, rather than having to search through email attachments. It also allows them to monitor the progress of individual projects quickly. When scripts are developed and pencillers lay out pages, those too are placed in Dropbox. From there, inkers and colourists access and update the files, saving them back into Dropbox for editorial review. "We pretty much don't handle physical artwork in the office at all any more" Stern says. "In part because of Dropbox Business, we've managed to successfully deliver files to our printer every week since we started publication". When it comes to collaborating with foreign publishing partners, Valiant again rely on Dropbox. International partners need access to entire comic books – as quickly as possible – so they can translate and redesign them. "For that process, I just give someone access to a folder on Dropbox and they have the full set of files they need for book production" explains Stern. With hundreds of industry events taking place around the world every year, travel is an integral part of the comic book business. However, there are still deadlines to be met, so it's imperative that employees at Valiant maintain productivity when they're away. "We have a fairly aggressive convention schedule that frequently takes staff members out of the city, so we use Dropbox Business to work on files from the road and keep up on tasks such as making advance copies of Valiant's comics available to the press" Stern adds. 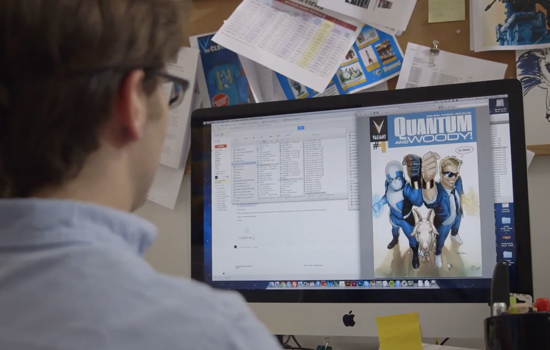 Dropbox Business even helped Valiant keep operations running during Hurricane Sandy. Although the Valiant office was inaccessible, all of the company's files were backed up offsite and available to employees throughout the storm. Stern attests "Hurricane Sandy shut down the city but, thanks to Dropbox, our publishing proceeded without a hiccup. We didn't miss a ship date." In an industry where production delays are common, it's a huge testament to Valiant Entertainment's approach and choice in resources that the company has such a solid record for keeping to its publishing schedule. "In the two years that we've been using Dropbox, we have not shipped a single product late" says Stern. "For a comic publisher of our size - I don't know if that achievement is unmatched, but it's definitely impressive."